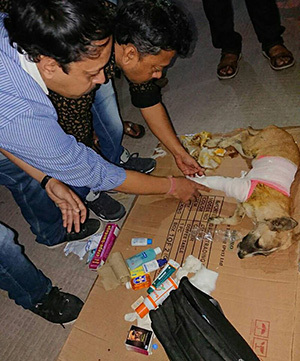 This young pup would have died if it hadn't been for 'People for Animals Siliguri'. A vehicle hurled her into a gutter where she lay in excruciating pain with a broken leg and losing blood from a gaping wound. Thanks to a kind passer-by who responded to her distressing cries, and the organisation's vets, she made a full recovery. WHO ARE ‘PEOPLE FOR ANIMALS SILIGURI’ (PFA)? PFA is a voluntary team of professionals who give up their free time to rescue and save the lives of street animals, livestock and wildlife in Siliguri, India. 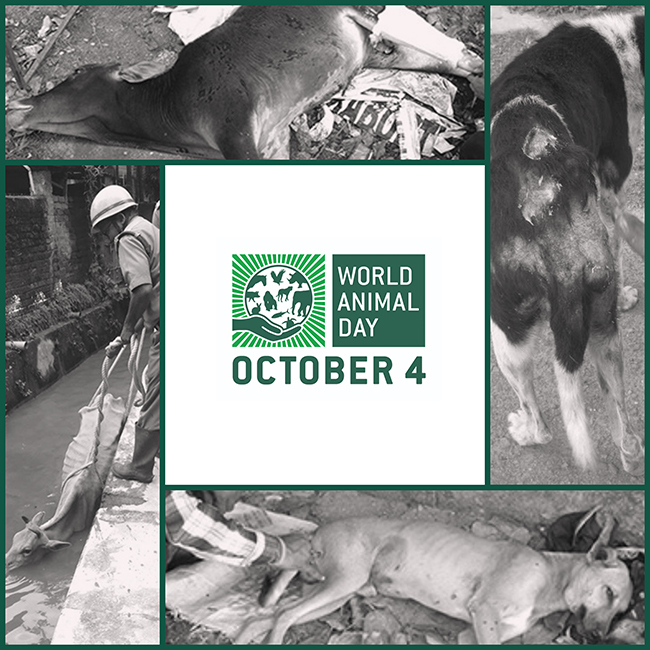 The organisation is led by our World Animal Day Ambassador, Sujoy Dutta. The city of Siliguri is expanding rapidly, which increases the urgency of PFA’s vets being able to get from A to B quickly. For ten years, PFA has been the sole provider of emergency care to animals in distress in the busy city and its suburbs covering approximately 17 square miles. AN ANIMAL AMBULANCE IS DESPERATELY NEEDED TO ENSURE INJURED AND SICK ANIMALS ARE REACHED SWIFTLY. WILL YOU HELP? PLEASE CONTRIBUTE WHATEVER YOU CAN AFFORD. TOGETHER WE WILL REDUCE THE SUFFERING OF DISTRESSED ANIMALS IN SILIGURI AND INCREASE THEIR CHANCE OF SURVIVAL. A conventional vehicle would be too large to navigate many of the city’s narrow lanes and passageways, not to mention the traffic. The free emergency vet service will become efficient, speedy and reliable. The ambulance will be able to navigate the city’s narrow lanes and passageways, enabling all locations to be reached. If specialist care is needed, it will be easy to transfer small and medium animals to the veterinary hospital without delay. No longer will animal emergencies be reliant on public transport. Recovering patients can be checked upon more regularly. The vehicle runs on a battery making it cheap to run and eco-friendly. And best of all…. the lives of even more animals will be saved. WILL YOU CONTRIBUTE TOWARDS AN ANIMAL AMBULANCE TO HELP SAVE THE LIVES OF ANIMALS? WILL YOU HELP IMPROVE THE EFFICIENCY OF SILIGURI’S ONLY EMERGENCY CARE SERVICE FOR ANIMALS? The local authorities highly respect the work of PFA. The government-run veterinary clinics in Siliguri provide most of their services free of charge to the organisation. Cases that require more complicated treatment, and emergency veterinary supplies, are paid for by funds raised through member contributions. It’s not just dogs who suffer serious injuries in road traffic accidents. The team are often called out to cows and other animals that roam freely in the noisy, bustling streets. The dedicated team of PFA volunteers strive to do their best in a bustling city with challenging roads and minimal resources. Their compassion is boundless and their rescue skills are polished – with your support, they’ll be unstoppable in their new animal ambulance. I urge you to contribute towards an animal ambulance to help the animals of Siliguri. With your kind support, PFA will be equipped to save the lives of even more animals. We look forward to sharing some of the success stories with you. Thank you for helping to secure a brighter future for animals in Siliguri. If funds allow, we will provide financial support for other deserving projects submitted by World Animal Day Ambassadors this year. This is the fifth year that Naturewatch Foundation has sponsored the World Animal Day grant.